Great content does little good if the right audience isn’t exposed to it. Meerkat and Twitter-owned Periscope are relatively new platforms that offer the ability to live-stream video content through a user’s Twitter feed. Meerkat gained 160,000 users in its first month and its CEO says it now has nearly 2 million users. How can businesses use Meerkat or Periscope for content distribution? Say your company president is making a speech at an event. You’re going to record it to post on YouTube, Vimeo, and other video sites. But what about live-streaming the speech? Both Meerkat and Periscope allow you to share that speech with all of your Twitter followers in real time. Similarly, any business that hosts conferences can stream some or all of the event – providing that content to an even wider audience. Even though these streaming services are relatively new, brands already are jumping on board. Wide-ranging organizations have tried their hand at Periscope: Park rangers at Glacier National Park gave viewers a tour of the beautiful landscape; GE streamed a top-notch science conversation with Bill Nye and Neil deGrasse Tyson; and Adidas revealed a contract signing with one of its top athletes. Though traditional print media audience numbers have been on the decline, online readership continues to flourish. Flipboard allows businesses to capitalize on that viewing growth through the creation of a digital magazine. 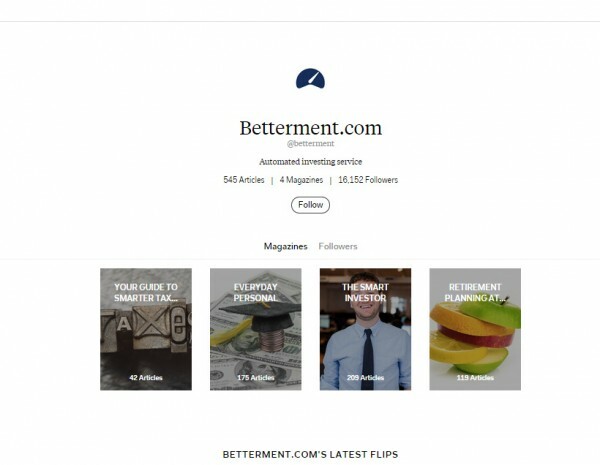 With Flipboard, businesses are able to not only promote their own content, but also curate the best content in their industry or vertical to create a custom magazine for online consumption. Flipboard-created magazines are not only beautifully designed but also provide a great user experience for desktop, mobile, and tablet users. Another great feature of Flipboard is the ability to mention users – and the benefit here is twofold. First, you can alert the users who are named that their content is in your magazine, which may prompt them to share with their own network. Second, you can find prospective users who are in your industry and like similar content, and alert those people about your Flipboard magazine. If your business is in an industry that covers many topics, create a separate Flipboard magazine for each. Similarly, if your business covers many locations, create Flipboards to incorporate local content. Want to see real-world examples of brands doing this well? Check out Woodford Reserve Whiskey, investment service Betterment, and the Chicago Tribune. Some of the best published content is content that is crowdsourced – providing opinions and perspectives from many individuals on a subject or topic. However, success requires a known network of individuals willing and able to contribute quality content. Enter BuzzStream, a tool that allows businesses to find influencers around any topic or niche, and provides influencer contact information by way of email address and/or social media profiles. Just as mentioning users in Flipboard can help expand your reach, using quotes and insights from influencers can do the same. You can add influencer quotes into blog posts, e-books, white papers, etc., or create a piece of content made up of influencer takeaways. Be sure to mention the influencer by name and link to his or her website, blog, or social profile to ensure proper attribution. Once completed and published, share the finished product with those who contributed and ask that they share with their networks. It’s a win-win: The influencer receives additional exposure from your content, and you receive additional exposure from the supplementary promotion. You also get the benefit of aligning your business and messaging with experts in the industry, which can strengthen your reputation. 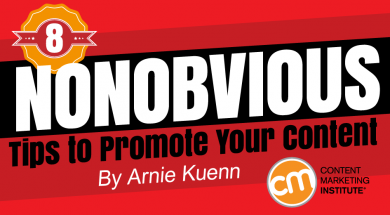 BuzzSumo may be a little more obvious than some of the other tips because it’s frequently discussed by CMI authors. BuzzSumo can be used to find influencers to interview and engage. However, it also offers content and social media analysis tools that are extremely useful for content promotion. Users can use BuzzSumo to search for the content that gets the most mentions and shares around any company or topic area. Leverage this feature to get a read on how your own content is performing from a social media and promotional standpoint, as well as to understand what topics and messaging are resonating with your audience. The data can help shape your promotional plan. Though you are privy to how your content is performing on your website and on your social channels, BuzzSumo allows you to understand performance at a higher level. By getting a baseline within the tool for what performs well and what doesn’t, you’ll be able to tailor further promotional efforts to be in line with what your audience responds to the most. You also can use the tool to take stock of what types of content pieces are among top performers and use that insight to your advantage in future content creation and promotion plans. Top-performing content data can provide insight on the best keywords on which to focus, what topics are driving the most social shares, and what types/formats are popular. You want to give your audience the content it wants and needs, and understanding and modeling your content on what is resonating is one of the best ways to do so. Many content communities and blog aggregators have well-established audiences who could benefit from your content. Though competition for traffic is fierce on popular content communities, if your content is truly outstanding you are likely to see success. On each community or aggregator site, create an account, submit your RSS feed link, and fill out the submission form. Most sites require you to choose a topic. Be sure to select the category most closely aligned to your business to drive the most relevant traffic to your site. Alltop is one of the most popular blog aggregators, featuring the best blog content around a number of different topics. For each topic, Alltop displays the headlines and first paragraph of the five newest information sources. Blog Engage is a content community where users read and vote on article submissions. When a post receives enough votes, it is featured on the Blog Engage home page. Triberr is a blog amplification tool that encourages bloggers who submit content to join “tribes” made up of other bloggers who write on similar topics. Each tribe then shares each other’s content, driving traffic and exposure for everyone. Without a solid content promotion plan in place, your content’s success will be extremely limited. In addition to the tried and true methods of promotion, consider including promotion platforms that are less obvious, such as the eight mentioned, in your next promotion plan. 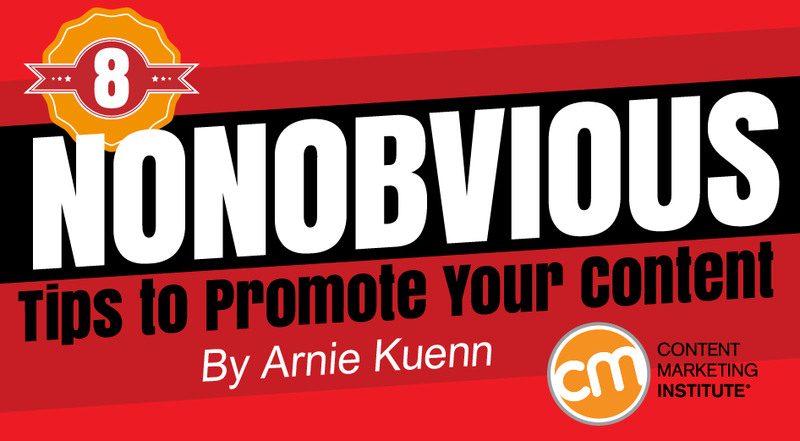 What new or little-known content promotion tips have worked for you? Let us know in the comment section below. Looking to grow your influencer marketing outreach and promotion? Download the CMI tool kit, The Complete Guide to Influencer Marketing: Strategies, Templates & Tools, which walks you through a simple 10-step process and provides three customizable templates.